Growing up in California, Mexican food is pretty much the closest thing to "food from home" that I've got. Whenever I travel off to foreign lands, Mexican food is the number one thing I miss - and is always the first meal I have upon returning home. Sometimes, I even stop and get some tacos on my way home from the airport. So, nothing says comfort to my psyche quite like Mexican food. In the summer time, I love throwing together "Mexi Bowls" - full of beans and spices and veggies and salsa... I've been missing that and was determined not to let the wintery season get in my way. On my first pass, I made a big batch of refried pinto beans, loaded with cumin and fresh salsa. Then I added in steamed cubes of winter squash, pan fried with toasted cumin and coconut oil. Tossed in some collared greens sauteed with garlic and veggie broth, some green peas (frozen), and topped it all with cilantro and fresh lime. Preheat your oven to 375 F, and line two baking sheets with foil. Toss the butternut cubes with 3/4 tsp olive oil, 1/4 tsp cumin, and 1/4 tsp coriander. Put on one baking sheet. Toss the chopped cauliflower with 3/4 tsp olive oil and 1/8 tsp salt, and put on your second baking sheet. Roast the veggies for 20 minutes - but give them a stir after 10 min. Meanwhile, rinse and chop your collard greens. In a large saute pan over medium-high heat, add 1/2 tsp olive oil and the sliced garlic. After about a minute or so, add the chopped collards. Add some water as needed to prevent sticking, and saute until the collards are bright green. Finally, combine the refries, salsa, and 1 tsp cumin in a small pot and mix well. Warm over medium-high heat until the beans are simmering and heated through. To serve, put half of the beans, half of the butternuts, half of the cauliflowers, and half of the collards in a giant bowl ~ and add as many of the garnishes as you want. Go crazy! 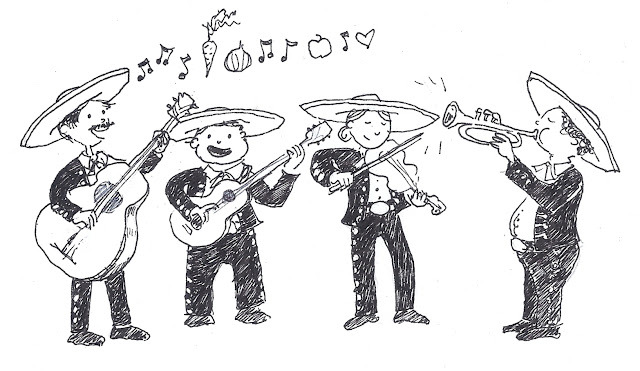 In addition to loving Mexican food, I also love love love love Mariachi Music. It is so amazing and alive! I made a doodle of Mariachis singing a song about vegetables. I've been really moving towards "bowls" lately and this one looks so good. I love the idea of something that's based on a sandwich or something more complicated and separate to be combined into an all encompassing and much easier to put together and eat bowl of chow. 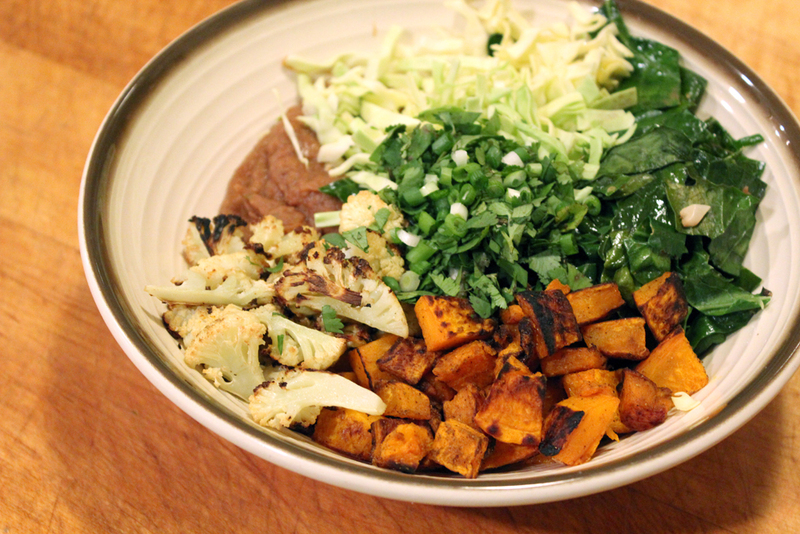 I know what you mean, bowls are totally the best: easy, one dish meals that really satisfy! without the fuss! I feel the same way about missing Mexican food when I travel abroad! It's such a part of my routine and day-to-day life, I was surprised the first time I went abroad and it was suddenly unavailable. So when I come home, I'm eager for tacos and burritos! 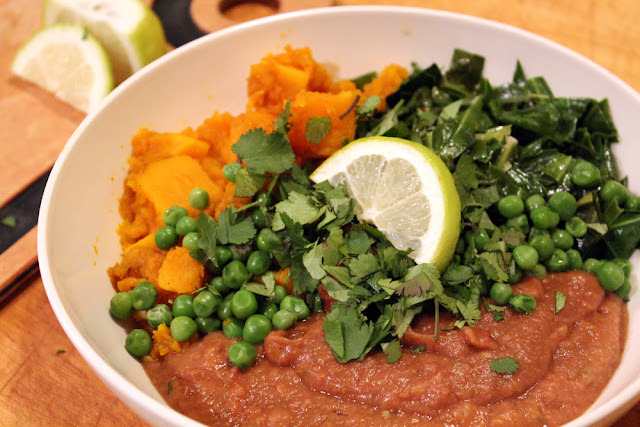 Side note, have you made the refried beans from Viva Vegan? They're my absolute favorite. My husband isn't into refried beans at all, and so that means I get to keep them all to myself. :) I love roasted vegetables, and I imagine they would be fabulous with all of those Mexican spices. Sounds wonderful! ooh this sounds amazing! i'm not a big mexican fan, but i'd love to try this! LM, try it!! Maybe you just need the right mexican food! Ooh, I love Mexibowls! I made one a few months ago with homemade refriend beans, brown rice, guac, and fried hominy. Soooooo tasty! 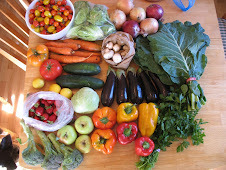 I bet the roasted veggies are a great addition! Great idea to include hominy! I've been cheating lately with storebought refries, so I need to get back on track with some homemade refries. 1) Love collard greens and would like to raise a statue in their honor; 2)Love Mexico and Mexican food; 3) Love the Mariachis singing about vegetables (although a little of the actual Mariachi music goes a long way for me, being a keyboard and stringed-instrument person). Muchisimas gracias. ha ha, excellent comment! Yes to a collard greens monument. I would definitely come to pay my respects. also, have you ever heard Linda Rondstadt's album "Canciones de Mi Padre" ?? It is so beautiful! I'm also a huge fan of Mexibowls - it's interesting how everyone has their own variation on them! I usually just use straight-up black beans and not refried, which I'm now realizing is crazy. Plus squash would be a great add-in!